Talk of closing one of the state’s higher education institutions has been circulating through weblogs, and was featured on the front page of the Aberdeen American News. This story is a perennial favorite with the South Dakota news tedia, and is published as regularly as the one they run each spring telling us that the ticks are coming and we should tuck our pants legs into our socks. So far no universities, except for Springfield, have closed, and I have seen no one walking around on spring outings with pants tucked into their socks, except for some bloggers of the right-wing stripe who were also wearing their chastity belts on the outside of their jeans. They wore the keys to the belts around their necks on a lanyard which stipulated "For emergencies and secular humanists only." A state legislator from Rapid City is planning to introduce a bill which would require the closing of one of the state’s campuses. Early this year an editor on the Argus Leader weblog called for the closing of Northern State University. A group is circulating a ballot measure to make the wearing of chastity belts mandatory. You know, click it or ticket. The secular humanists have raised a clamor because it doesn't contain an exception for eunuchs. Many factors are contributing to the urge to close down a college. One is the establishment of University Center in Sioux Falls. It is a place where the state colleges offer a range of courses to serve the people in the state's largest metro area. A lot of folks think it is a seventh university. Now some people in Rapid City also want a university center of that nature. On top of that the Board of Regents want to spend a bunch of money for labs on each campus. That is a stickler of a problem because most people in South Dakota think a lab is either black or yellow and retrieves dead birds. Geesh, they say, first they want to spend money on laptops for each student and now they want to give them labs. And then there is the South Dakota rule: you can't improve education by throwing money at it. People in South Dakota are really for education if it doesn't cost anything. And if money came from somewhere to throw at education, it would ruin the state's distinctive ranking for teacher pay and per-pupil spending, but the legislature would have more occasion to rise on the floor of its chambers and say you can't improve education by throwing money at it, and don't judge another person until you have walked a mile in his/her chastity belt. What the legislature doesn't expend in money it makes up for in wisdom. There is a simple way to solve the issue of closing a campus. Have a lottery. Like the one in that Shirley Jackson short story we all had to read in high school, "The Lottery." The campus presidents come before the Board of Regents and reach into a hat and draw out slip of paper. The campus of the president who draws out the slip with the black dot on it gets to be closed. The people will get to converge on that campus with their sledge hammers, chain saws, barn cleaners, Bobcats, end loaders, and bulldozers and assail everything on that campus until it is pulverized. With the exception of the political science departments. They will be moved to a reservation in the Badlands where they can work out how millions of years of evolution got packed into 6,000, how Al Gore made up all that stuff about global warming, and how to conduct a liberal eradication program in a way so that no one will call them fascists. The president who wins the lottery will be blessed by Regents President Harvey Jewett and be given lifetime tenure as the gatekeeper in the Badlands at the Political Scientists Center for Small Particle Physics, Stem Cell Palaver, Literary Criticism, Global Warming Denial, General Fatuity, and Altar Society. The anagram is a quotation from the ever-eloquent George W. Bush. When a reporter asked him just what we think we are doing in Iraq, the President said, "PSCSPPSCPLCGWDGFAS." He is widely quoted by political scientists. The campus closing lottery would be an annual event, because campuses are like prairie dogs. You take one out over here and another one pops up over there. Closing campuses requires an ongoing effort. We might humbly make a suggestion about the campus closing issue. No. We'll make it arrogantly. Have you noticed that even with distance learning and computers, the demand for higher education centers is increasing? As a scientist on a nearby campus told me, no matter how sophisticated the computers and fast the network, you can't conduct laboratories by computer. The very word college means, among other things, a body of persons gathered together for a common purpose. No matter how advanced the technological delivery of materials, students and professors need a place to gather on occasion to coordinate, compare, and review the learning activities. In other words, the need for campuses or learning centers is increasing, not decreasing. The information age has made successful learning more intensive and more interactive. And higher education serves a much larger and diverse constituency than 18-t0-24-year-olds who take up residency on or near campuses. Deployment of learning resources requires meeting facilities at places convenient to the students. A political scientist took issue with something South Dakota War College said in regard to the campus closing issue. By the way, SDWC must be emitting some powerful pheromones of late because the blog buddies sure like to piddle with PP. Anyway, PP referred to liberal arts institutions, and the political scientist corrected him and said South Dakota universities are actually vocational in nature. The last I knew, the universities offer bachelor of arts degrees, which require a broad selection of courses from many disciplines. Perhaps it wasn't a pheromone but that word "liberal" that set the political scientist off. But the political scientist has a point. In the 1980s, for example, a college president at NSU made a strenuous effort to have the college classified as a comprehensive university. That meant that it offers a full range of curricula in the liberal arts and in specialty areas. But a mandate came down from on high, meaning the Regents office, to eliminate duplicate programs and impose minimum enrollment quotas before a class could be held. In addition, there was a struggle to limit the general education (or liberal arts) component. Students had two major complaints as a result of the retrenching. They could not get the courses they needed to complete their majors in a reasonable time. And when they applied for premium jobs or graduate schools, they found their degrees were not competitive. I recall a number of students who had to take more undergraduate work before being admitted to graduate programs. Their degrees were regarded as vocational rather than liberal. The policies of the past have caught up with the South Dakota system. The attempts to upgrade the science laboratories on the campuses reflect decades of negligence. In the 20 years I was at NSU, the scientists complained constantly about how absurdly inadequate the science labs were. South Dakota has also ranked at the absolute bottom for the amount of money invested in research. The Regents have launched a program to elevate that ranking in conjunction with the development of the Homestake DUSEL, but that also takes money. And scientific and engineering research are not the only areas of research that need support and resources. Before the legislature does something hasty and foolish in regard to closing a campus, it needs to get an inventory of the resources and inadequacies of the system it has. The way to do that is to ask the professors, not the Regents. The selection of regents. Currently, they are purely political appointees, and few of them have any real familiarity with higher education. They could be elected. But at least they should be nominated by a bipartisan panel of people involved in higher education with approval required by a 60 percent vote of the State Senate. There needs to be some provisions to make them responsible to the professional educators as well as the general public. Require that campus presidents also be approved by a legislative process. South Dakota needs college presidents who are chosen for academic leadership and diplomacy rather than to be shop foremen who carry out the often ignorant and destructive policies of regents. Require that faculty senates issue annual reports on the performance of their campuses and the problems encountered. Obtain optional plans for the deployment of resources and faculty throughout the state. This might involve a change in the way the system is administered. Primarily, get information from the people who are educated to do the work, are involved in doing the work, and whose professional activities keep them in touch with how the work is done in other places. Over the years I had colleagues leave South Dakota for better jobs in other places. When they left, they raised the question of whether South Dakota really wants to be in the higher education enterprise and whether it has the resources. That is the first question that needs an answer. Orwell was a satirist, not a dogmatist. It is not his fault that a significant faction of the population regards his writing, such as 1984 and Animal Farm, as field manuals for moving us toward totalitarian rule. As is the case with the good people of Oceania, we are mired in a contrived war which has been used to intimidate the gullible into a patriotic frenzy in which they are willing to relinquish Constitutional rights and give the state permission to intrude on their privacy, spy on them, and suspend due process. Perhaps the most salient feature of this movement is the propaganda strategy that propels it. That strategy is to locate those little areas of hatred, discrimination, resentment and fear and agitate them into festering boils in the brain pans of the susceptible. As in 1984. the people are given their five minutes of hate. Except now it takes the form of the interminable and tendentious cries of accusatory alarm rolling through the blog aggregators. The regressives have a new cry of outrage. That cry is over the fact that many university faculties are predominantly Democratic. My alma mater, the University of Iowa, has been selected as a particular target for the cries of outrage. A scholar of the regressive stripe applied for a job in the history department and did not get it and filed a complaint with the Equal Opportunity office at the University. That complaint has been fanned into the charge by the regressive factions that the history department at Iowa is an ideological monolith. The applicant also was rejected by Duke University, but the fact is that he has compiled quite a history of rejection, including by the U.S Air Force War College. He has written a book in which he takes the stance that America was justified in waging the Viet Nam War. The fact that he cannot find a job in the academic world is cited as evidence that higher education is dominated by liberals who don’t give conservatives a chance. The regressives point out that the University of Iowa History Department has 27 faculty and all are registered Democrats. The local paper in Iowa City even went to the effort to track the faculty’s voter registrations, which is okay because voter lists are public records. They do not indicate how people voted, but they indicate what party they register so that they may vote in the primaries. This whole idea of party affiliation as an element of diversity flummoxes me. I cannot recall a time in 30 years of applying for academic jobs and sitting on search committees where political affiliation came up in regard to a candidate. I do recall concerns about a few Marxist scholars and whether they would cover their subjects fairly or would use their teaching to condition students with an ideological agenda. That is a legitimate concern. But I cannot recall a time when the question of whether a candidate is conservative or liberal was broached. Committees are too involved in looking at candidate’s credentials and trying to see how they would fit into their departments’ curricula and academic functioning. The demeanor and attitudes of candidates have more to do with considerations for employment than does any political affiliations they have. Often, the credential files reflect attitudes that .indicate that a candidate has personality issues that would not make the person a good hire. They are usually screened out during the early stages of the selection process. And often when people do advance to the interview stage, they display traits and attitudes that indicate that they might interfere with the functioning of the department. Many competent scholars come up short on their intrapersonal skills. As for Iowa, from where I have two degrees, I have no idea what the political preferences were of the faculty I worked with. They were not relevant to the work that occupied us. As in any department, there are a few members who are more politically active than others. At Iowa, the legendary novelist Vance Bourjaily in the Writers Workshop was an active Democrat. He gave fund-raising parties at his farm for Democrats, but those affairs were more social and literary than political. No one could make the most remote claim that Bourjaily’s political preference in any way affected his writing or his teaching. It was just part of a complex, many-faceted, and fascinating personality. The import of all this, however, is that professorships are now regarded as indoctrination platforms. The assumption is that being a registered Democrat is a sign of political seepage that contaminates the intellectual environment. And so the regressives are cyring out for their chance to lend their particular brand of contamination to the battle for minds. They see academe as an Orwellian bureaucracy, not a neutral agency of thought and study that considers but transcends partisan ideas. Big Brother wants his niche behind the lectern. An irony is that Jon Lauck who wrote Daschle vs. Thune has an article in the online History News Network in which he encourages historians to get involved in campaign politics. He testifies what an edifying experience it was for him to be a consultant to John Thune. Lauck, by the way has a Ph.D. in history from the University of Iowa. Actually, he was a paid agent and provocateur at the time he held a professor’s chair at SDSU. I have called him a paid character assassin because he took after Tom Daschle like the boys at the Ministry of Truth in 1984 took after those the party labeled enemies of the state. But the real question raised is how he reconciled his role as a political agent with his role as a professor. I question this because I used to post satirical materials that sometimes had political ramifications on my office door and was asked to refrain from the practice. I was told that it compromised my role as a professor. 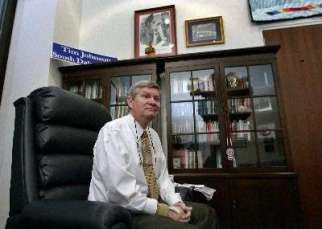 But here was Lauck occupying an office on campus and being paid to vilify Tom Daschle. He is no longer a professor, and I do not know how the issue of him reconciling his political activities with his professor’s duties was resolved. But in the HNN article cited above, he seems to regard a professorship as a place to engage in political propaganda. Some inheritors of his blog at NSU also seem to think that a professorship is a platform for launching political propaganda. They use their professorships as a special authority to engage in Ministry of Truth-like portrayals of people, issues, and events. While much of their effort is self-stimulation of erectile little egos, some of it involves falsified representations and personal defamations of the type that professors are not supposed to commit under any circumstances. We note that the University of Colorado fired a professor for indulging himself in such tactics. The complaints about a liberal bias on campuses seems to be based on the notion that campuses are a front for political battles and the regressives want a louder voice. In South Dakota, the issue of its relatively small population and its number of university campuses has brought up the question again of closing down one or more campuses. If we have reached the point where campuses are merely turf over which partisans do battle, it might be time to close them all down and start over. Big Brother does a lousy job of educating youth. That's what Geroge Orwell tried to tell us. And so did Sinclair Lewis. The regressives on the blogosquare want to get Sen. Tim Johnson out of office. They hover over their keyboards drooling over any halting moments in the Senator's speech that they can contrive into evidence that he can't do the job of Senator. Despite the fact that the Senator has not missed a vote since his return to the Senate chamber in August, that he now visits the state and has resumed his meetings and telephone briefings with reporters, that he has supplied updates and analysis of legislation since last spring, and that last week he walked onto the Senate floor with the aid of his cane, the malevolent lobby finds that a brief pause while searching for a word is the sign of incapacity. The real problem is that even with a severe brain injury, Sen. Johnson has not reached the level of inarticulation of their regressive Alpha male, George W. Bush. If you need a review of W's bon mots, click here and play the videos. While America speculates about what might happen in Iraq if it withdraws its troops, Britain today is relinquishing control of Basra Province to the Iraqis. Britain has had charge of the province since the American-led invasion of Iraq in March 2003. Britain began its withdrawal three months ago when it pulled out of the city of Basra. It did so with the recognition that the patrols of its uniformed troops as an occupying force provoked violence against them. The withdrawal of British troops from the city was followed by a marked decrease in the violence. Basra is the key to economic independence for Iraq. Ninety percent of the country's wealth comes from the oil revenues. Basra is central to the oil industry in Iraq and Basra city is the country's only deep sea port from which oil is exported. Basra is the ninth province in Iraq to be returned to Iraqi control. The British plan to reduce the level of their presence in Iraq to 2,500 troops by spring. One of the most prevalent false myths in America is about the virtues of competition. When people compete, we like to say, they are more productive and produce better products, and competition builds character. We seldom note that when people compete, they tend to cheat. As did a number of major league baseball players according to George Mitchell’s report, and Olympic athletes who have been stripped of their medals. Friendly competition under rules of fair play can be fun and productive. But competition rarely remains friendly. Competitors have a way of turning into enemies. And enemies develop the attitude of winning at all costs. The real facts of competition have made me a somewhat tepid sports fan. As a college student who had to work, I started out in journalism on the sports desk of the old Davenport, Iowa, Morning Democrat. The sports editor was a very famous figure in the sports world and spent more time downstairs at The Ringside Tap schmoozing with sports celebrities who stopped by to see him than he did on the sports desk. That left the sports staff to deal with all those competitors for whom getting good press was part of winning. We often saw humanity at its worst in ways that rivaled anything the guys on the police beat came across. I witnessed high school coaches who ran model athletic programs get fired because they were not ruthless enough in going after wins. Schools which were supposed to be tending to education got mired down in community disputes over sports. To many “fans” it is more important to produce winning teams than to educate young people. At that time, the major sports venue in that part of the Midwest was the Big Ten. Iowa and Illinois teams in the conference did not play each other because the rivalries were so intense the players fought and the fans rioted, and meetings between the teams were considered a threat to public safety. You know, character building. Back then, cheating was a problem, as it is now. In both high schools and colleges, there were constant complaints from the teaching staffs about pressures to give passing grades to athletes who were failing so that they could remain eligible. Alex Karas played for Iowa at the time, and he later developed some comedy routines on courses developed specially to make them passable for athletes. In college sports, star athletes found that the schools competed for them by requiring few classes but providing much in the way of housing, cars, women, and all manner of diversion as long they stayed in shape enough to win games. Sports are not the only area where competition can have a deleterious effect on character and integrity. The No Child Left Behind competition has produced a rash of cheating on tests and school records. Kids have been given some very good lessons in how to compete. And does one even need to mention the forms that competition takes in the business world? They have a semantic cover, however. Anything that costs people their jobs or provides them an inferior product is called a business decision, a term which legitimizes fraud and corporate tyranny. Professional sports have little to do with sports . They are first and foremost businesses, and fooling the consumer of them is what their business is all about. Their standards of performance are emulated in our schools: win at all costs. If we were true to our real faith, our currency would say “Win at all costs” instead of “In God We Trust.” Winning is our salvation. We divide humanity into winners and losers, and anything is permissible to avoid being called a loser. So, pass the steroids, please, and praise the lord, and salute the flag at the start of every competition. This week only two Ph.D. students were found massacred down on the Louisiana State University campus. It's still early in the weekend, however. Hey, putz, choose your weapon. Cory Allen Heidelberger of Madville Times has been posting on blogging as a long tradition of discourse in America. He cites the book The Rise of the Blogosphere by Aaron Barlow who sees blogging in the tradition of journalism before it became a profession. Barlow lists The Federalist Papers, Thomas Paine, Ben Franklin, and Alexander Hamilton as examples of blogs and bloggers in their time. Alexander Hamilton, in fact, got killed for his “blogging.” His attack on the character of Aaron Burr became a matter of such rancor that it resulted in a duel, which, of course, Hamilton lost. The Hamilton-Burr duel provided some of the motivation for the “professionalizing” of the press. Just as James Madison in The Tenth Federalist Paper saw the representative government of a republic as a way to moderate the passions and rancor of factions in a democracy, early journalists saw a need to moderate and refine what was published in the media of the time. The passions of people who were attacked became so inflamed that they thought the accusations made against them needed some final resolution by resulting in the death of one of the combatants. The early days of the republic were also very litigious. Many people thought the courts rather than duels were the way to deal with accusations and characterizations published about them. The courts were clogged with cases, and through case law gradually developed legal definitions of libel that provided quick resolutions to the cases. They defined types of libel which presumed damage on their face and types which damaged by implication. But all that has changed. People who find themselves victims of libel today have little chance of resolving their grievances in the courts. We might need to revive dueling as a means of redressing grievances against libel and prove to ourselves once again the efficacy of using words with skill and responsibility. Journalism of the early nineteenth century started the development of reporting and editing as a professional activity which avoided those aspects of public discourse which inflamed the passions rather than informed the reason. Those of us who take a literary approach to verbal communications have been talking much of what literary traditions inform blog writing and what genres they entail. The Internet is a medium to which writers bring many traditions. Some are literate. Some ain’t. Many bloggers draw on the tradition of the personal essay, which is not taught very often as a literary mode of expression. Some work in the tradition of argument-advancing rhetoric, which utilizes the literary standards of argumentation. And many draw from the Hugo Chavez school of discourse in which the kind of false accusations, insults, personal abuse, and malicious deception form the larger part of their expressive efforts. Early commentators of the American tradition were largely self taught, but they learned the efficacy of developing editorial judgment or consulting with editors to check the effect of their writing. Thomas Paine stands out for the impact his pamphlets had on the American revolution. Most of Thomas Jefferson’s writing was in `18,000 letters. Ben Franklin developed journalistic pieces into major works of cultural criticism and political satire. That’s why he became known in Britain as the most dangerous man in America. Abraham Lincoln’s legacy is in his speeches, which incorporate a number of the literary features that distinguish the English language tradition. But most of American literary effort from the early theater, to the sermon and lecture, to journalism, and to culturally self-conscious literature is composed of works that have a high rhetorical purpose. And its participants were extensively read in the theory and practice of rhetoric and the literary merits of effective writing. Aaron Barlow discusses the protocols and operating rules of rhetoric on his blog. The decline of the teaching of English and of rhetoric as a literary enterprise is a factor in the new illiteracy. While there is much anguish and wailing over the status of math and science in American education, few people except teachers of English note the decline in the teaching of the language arts and their literary components. The art of nonfiction has largely been dropped from the teaching of literature, which is devoted to fiction, poetry, and drama. And the number of all literature courses in general education requirements has been cut significantly. In my last years of teaching, I taught courses in the theory and practice of rhetoric, but spent a good deal of time covering material which was once taught in freshmen composition courses. Most people now think that the teaching of English is a matter of how to avoid sentence-level errors in spelling, punctuation, and grammar. Now that writers are looking at the literary traditions that are involved in blogging, maybe we don’t have to whet our rapiers or tune up our dueling pistols. But then, again, some blogs were invented as vehicles of defamation, scurrility, and hatred. In any case, it might be time to look at another aspect of our education that has fallen to neglect. The holiday season is upon us so the armed security guards at churches and shopping malls may have to work overtime. The celebration of peace on earth and good will toward all people intensifies. One young man killed a bunch of people at an Omaha mall, another gunned down people at a missionary training center and a church in Colorado, and six high school students were blasted at in Las Vegas as they got off a school bus. The spirit of Christmas is a-raging. In two of those cases, at least, the perpetrators, as the celebrants are sometimes called, posted warnings or what could be regarded as warnings on the Internet. This is part of what has become a traditional way of expressing joy and spreading good will throughout the land. You plan a massacre and announce it in advance. Who can forget the wonderful times of Columbine, Virginia Tech, Red Lake—the list goes on and on—and the moments they gave us? Even those alien types we call terrorists want to get in on the act. They gave us 9/11. And those envious folks in Iraq made these celebrations of peace and good will the essential feature of their culture. Joy to the world. This kind of celebration has largely been developed by the young—people under 25 when the brain is not fully developed. But our culture supplies them what maturity denies them. It provides video games that coach them in the killing arts—particularly with things like assault rifles. But mostly it has the Internet where they can gather in packs and insult and abuse each other and raise the level of adrenaline and anger to the point that they want to get off the couch and go out and really do something. Political blogs and discussion boards are a real resource if you want to find insults and name-calling and accusations and lies of the kind that can really get you to the point where you say, “I’m not going to take this anymore; I’m going to do something about it.” All you have to do to get really torqued off is browse the blogosphere, as this warp in the planet is called. The support system goes beyond the Internet. You can find examples of dishonesty and indecency that will hype up the anger hormones almost everywhere. One is a feature of public discourse that we have come to call Swift-boating. If you or some one you like is Swift=boated, you soon realize that there is no rational response because the only purpose of Swift-boating to is incite hatred and anger. Refuting a Swift-boat is a waste of time. You have nothing to do but act out. Or turn the other cheek and get hit with the other fist. And then you will really be torqued off and inspired. The mass media can supply all your party needs. Osama bin Laden is there to teach you the art of hate and vicious rhetoric and killing lots of people. If a more western style of mindless belligerence fits your taste, you can have examples of our own leaders insisting that someone is getting ready to attack us with weapons of mass destruction and we’d better get them before they get us, and that is what we do. And it gives us years and years of watching bunches of people getting killed and maimed, and we can feel real good about all the peace and good will we are spreading. The election campaign is sure to provide some moments of pure inspiration. While some candidates will try to make nice, the media will soon goad them into attacking each other and getting real mean and stupid, and you will undoubtedly find examples of how to be mean, stupid, and vicious. But that resource is always available on some talk radio shows and some blogs. We have developed an entire grammar and rhetoric to develop and support mindless rage. We even offer college courses in it. Nobody has a reason not to get torqued off and get off their duffs and do something. Just read blogs and their comments. In a democracy like ours, we fulfill everyone’s needs. It’s all in the rhetoric. Actually, it is in the ignorance of what rhetoric really is. Merry Christmas, happy holidays, or whatever. May the peace of the season be with you all year. The Sioux nations have never assented to any changes in the treaty and have never relinquished their claim to the land, although it was taken from them. In 1980, the U.S. Supreme Court said they had never been properly compensated for the land and awarded them compensation plus interest, which amounts to about $120 million. The Sioux nations have refused to accept the money. They want their land back. They want adherence to the treaty. Bear Butte sits in the middle of the land they claim and stands as a focal point for what the land means to them. The question of whether using tax money to obtain a buffer zone around Bear Butte to preserve its geographical, historical, and spiritual significance might violate the establishment clause of the Constitution is not relevant to the legal issues that concern it. To the Sioux Nations, compensating land holders for a buffer zone is giving them money for land they do not legally own and on which they are trespassing. In the 1980s, Sen. Bill Bradley enraged South Dakotans by submitting a bill that would resolve the dispute over the land by returning undeveloped land in the Black Hills to the indigenous people along with compensation. The Sioux people hold that there is a spiritual presence in all creation that cannot be separated from it. Whether Bear Butte is treated as a natural treasure, a historic site, or a state park, they will observe its full significance for the indigenous people. The issue is not the spending of state money to preserve the integrity of the site, but whether the right of the indigenous people to maintain the site is acknowledged and restored. Both the Sioux Falls Argus Leader and the Rapid City Journal carry stories today on Sen. Tim Johnson and his recovery from the brain hemorrhage he suffered a year ago. Prof. Blanchard assumes a prodigious responsibility when he calls into question more than 55 years of the study (including a doctorate), the practice, and teaching of rhetoric. However, the point is that there are more appropriate and effective venues to resolve such accusations than on Internet blogs. For readers and contributors who frequent the Internet for purposes of information and discussion, the issue is the definition of terms which describe rhetorical errors. The teaching of rhetoric as a discipline has been displaced by the teaching of technical production of the electronic media. While some universities have tried to include the complications of hypertext writing in their courses of instruction, there is more involved than can be accommodated in the ordinary college curriculum. Dakota State University, for example, offers a curriculum in writing for information systems and deals with what is sometimes referred to as the “new rhetoric” as writing applies to computer technology and the way visual and aural images affect communications. One can enter any term for a rhetorical fallacy into an Internet browser—such as ad hominem, straw man, bifurcation, equivocation—and come up with thousands of sites that offer definitions of the terms. Nearly all of the definitions will be accurate, but none will be comprehensive. (Ad hominem on Google produces, 233,000 citations.) That leads some people into choosing a definition they prefer and concluding that others are inaccurate. Rhetoric, as with all disciplines, has many facets and dimensions. The purpose of scholarship is to make essential distinctions and to work toward a comprehensive knowledge. That does not mean dismissing definitions that are merely inconvenient or disagreeable to one/s purpose of the moment. The ad hominem fallacy is the most frequent error to occur on the Internet, but it is a general term that covers many forms, such as the abusive ad hominem, the circumstantial ad hominem, and ad hominem tu quoque. These categories adhere closely to the categories that define libel. Many of the Internet sites provide definitions in the context of formal debate and provide examples of syllogistic reasoning that focuses on statements that can be reduced to formulas. They examine argument on the level of grammar, which deals with words and how they form sentences. Words and sentences, however, do not occur in isolation. Statements have pretexts, texts, subtexts, and contexts. The meaning of words is often controlled by when, how, for what purpose, and in what context they occur. In addition to their grammatical meaning, words are signs that draw their significance from their contexts. These contexts are amplified and complicated in the electronic media. Contemporary rhetoric, therefore, requires not just a command of grammar, but a command of semiotics—the study of signs and symbols that comprise the range of human communications and how they relate and influence each other. Some sources suggest that it is an error to cite all instances of personal abuse as ad hominem fallacies. However, anytime someone tries to discredit what another person says and to discredit the person, the pretext and the context and the subtext broaden the focus to the person, and the text must be perceived as part of those circumstances. Forms of debate governed by Roberts Rules of Order and the rules of order of the U.S Senate have elaborate measures to prevent any dialogue from becoming personal. For example, one always addresses the chair, not members of the body. When it is necessary to refer to another member, it requires that it be done so with great courtesy, such as referring to “my esteemed colleague.” The pervasive damage of the personal attack cannot help but detract from and debase the legitimacy of an argument. Very often, arguments are raised as the pretexts for making personal attacks. It is pointless to try to defend oneself against the malicious. That is why many of us who write wonder if we are not merely inciting more malice when we write for blogs. It is terribly wasteful to use a resource like the Internet for personal vendettas. There has to be a better way to engage in discussion, and some of us are set on finding it. In addition to his addiction to the ad hominem argument, Ken Blanchard loves to indulge in the rhetorical fallacies of bifurcation and equivocation. He gives a very narrow definition of the straw man fallacy and then asserts I was wrong in a definition I gave. Insisting that only his definition is correct, he says mine was wrong. That is called the fallacy of bifurcation. Description: It is a fallacy to misrepresent someone else's position for the purposes of more easily attacking it, then to knock down that misrepresented position, and then to conclude that the original position has been demolished. It is a fallacy because it fails to deal with the actual arguments that one has made. I also take issue with his gross misrepresentation that I have contempt for the people of South Dakota. Pointing out that some people in the state have a provincial outlook and that some have fallen victim to a propaganda campaign is not registering contempt. I do have contempt for such misrepresentations. How do you know a putz when you see one? Or, a putz by any other name is a putz. Sometimes we refer to a certain stupid verbal phenomenon as the straw man fallacy. It is when one person makes up a bunch of stuff about someone and then attacks that someone for possessing all the fabricated things attributed to him or her. Often people who make up things about other people come to have a pathological belief in them. The delusions become part of their creed. The things they make up and believe in originate in their ignorance, prejudice, and innate human need to hate, but they worship them devoutly. If you want examples of their liturgy, go to a thread at South Dakota War College on the Argus Leader review of Jon Lauck’s book Daschle vs. Thune You will see a multitude of comments in which a few stalwart souls try to engage in a somewhat reasoned discourse with people who merely wish to attack the straw men they created and now threatens their world. The rational ones tend to sign their names to what they post. The others cower and snivel and hurl abuse from behind their cyber anonymity, like belligerent children hiding behind their mamas. There is much name-calling and maligning of character and personality on this thread, as is characteristic of blogs and discussion boards in general. Most people who frequent blogs don’t know the difference between naming—the proper application of nomenclature to the thing being described—and gratuitous name calling—the infliction of harm and abuse on someone by terming them something denigrating and odious. People get exercised by the name-calling and insult. They tend to forget that when a person calls you a name or imposes an image on you created out of their mental failings, they are giving anyone who cares to notice a map of their mentalities, a window into their essential character, a printout of their mental processes. These individuals have the right in our culture to express their minds. We have the right to note the shortcomings of their minds, but we need to learn how wasteful it is to engage them. Some call that elitism. In our age anyone with brain cells that function seems to be elitist. The blog discussions of Jon Lauck’s book are largely inane. The “reviews” of it have said little about what the book actually accomplishes and how it does it, thus not fulfilling the function of a review. So, much discussion has been taking place and no one seems to know exactly what it is they are discussing. In noting what information is available through a review, I made the point that the focus of the book on the Argus Leader as a medium of partiality seems to obscure the fact that all of the news media in South Dakota tend to let partisanship determine their news coverage. The review in the Argus Leader overtly informs the reader that it will not deal with the substantive materials in the book—somewhat strange for a book that purports to be history—and concentrates on the book’s treatment of the Argus Leader. I said nothing regarding the worth of the book, but comments I did make excited fellow-blogger Prof. Jon Schaff to break open a bale of straw and erect an effigy in my name. He states, “Of course, it is unlikely that Newquist would approve of any review that didn't trash the book and discuss the degradation to American civilization caused by the scurrilousness of Lauck's Orwellian fascism.” While I admit there is a crude likeness in this image, it is still a very crude straw man which represents Prof. Schaff’s thinking, and certainly not mine. I have a reverence for books and expectations for essays which presume to review them. Jon Lauck’s book has not yet received a substantial review that gives readers a descriptive overview of the book and examines its premise and its achievement. That was my point. I don’t know how the book treats Lauck’s role in the Daschle/Thune campaign, but I know that he was a paid blogger while a professor at SDSU and much of his blogging was devoted to character assassination and appeals to the ignorance, prejudice, and mean resentments of a very provincial culture. People like blogger and commenter Jer Bear have saved examples of his work. Scurrilous? I don’t know of a better word to describe the example. Or the comment thread at South Dakota War College on the alleged book review. Fascist? Fascism is undergoing a renaissance in the 21st century. It has pervaded American politics. Our current regime is fascist in many aspects. It espouses a belligerent nationalism. It is militaristic. It is moving toward totalitarianism with its warrantless wiretaps, its advocacy of torture, its systematic defamations of its opponents and its repressive policies and actions, its control by a corporate hierarchy that is allowed to set policy and rig the economy to only its advantage, It fits the descriptive taxonomy that defines fascism. Anyone who supports the ideologies and political machinations that define fascism might be said to be a fascist as a legitimate denotative term, not as a gratuitous epithet. I don’t know just how far Lauck’s conservatism accommodates fascism, and I wouldn’t call him fascist, although he seems to embrace fascist principles and totalitarian propaganda techniques. And I don’t think his boss is cerebral enough to be self-consciously fascist. He is just obedient to those who give him his marching orders. Orwellian? Jon Lauck was part of a campaign based upon misdirection, defamations, and misinformation designed to appeal to the fears, peevish resentments, and small-mindedness of an exceptionally provincial electorate. When college freshmen from small communities in South Dakota return home for vacations, they find that their former classmates and friends, except for those who also went off to college, regard them with suspicion and resentment, as leaving the community for college is a snobbish affront. If they succeed and make their way in the outside world, it is regarded as an unforgivable sin. When a political leader goes to Washington, his/her constituents begin to suspect that they are being betrayed. If that leader gains success and recognition, the folks back in the province get resentful and feel neglected and betrayed that anyone would dare fix on horizons beyond their parochial vision. This, among other appeals to petty jealousy and resentment, was used effectively against Tom Daschle, as it was George McGovern before him and crops up against Stephanie Herseth Sandlin. It was a very effective tactic. The question is whether it is intellectually and morally defensible. Daschle supporters are often told that the election is over and to get over it. It was not Daschle’s loss that is the issue. The issue is that the campaign n that won adopted the propaganda philosophy and perfidious techniques of the worst and most repressive political regimes of the last century or so. It has left the stain of malice on the state and nation. There is no doubt that, from hindsight, the Daschle campaign made some mistakes. I was involved in the campaign and participated in the canvassing of the eastern part of South Dakota. We knew there were problems and knew what they were. The ruling attitude of the campaign was that the majority of voters would not be swayed by disinformation and phony issues raised by the Thune campaign and would rise above them. This was a tactical mistake, but not a moral one. A cursory look at Daschle vs. Thune did not reveal that much is said about the thinking and strategy on which the campaign operated. Rather, it seems to focus on the alleged partialities of the Argus Leader and its portrayal of Tom Daschle as a dissembler. No reviews have so far ventured to deal with those claims. Most people can recognize the semiotic nonsense in those titles, but they are not as adept as recognizing it in political discourse and books. Daschle vs. Thune exists in a context of semantic intent and historical fact. It has not been examined in those terms to date. It will be, if it is taken seriously as a contribution to history. In the meantime, we’ll keep our putz dry. The New York Times reports that business lobbies are rushing to obtain permission to pollute and enact anti-worker rules before George Bush leaves office. Hoping to lock in policies backed by a pro-business administration, poultry farmers are seeking an exemption for the smelly fumes produced by tons of chicken manure. Businesses are lobbying the Bush administration to roll back rules that let employees take time off for family needs and medical problems. And electric power companies are pushing the government to relax pollution-control requirements. The Sioux Falls Argus Leader published a review of sorts of Jon Lauck’s book Daschle vs. Thune, which should put an end to the petulant whining about the newspaper not reviewing the book. It won’t. The whining will persist, you can be assured. South Dakota has more newspapers that display a conservative agenda in their coverage and writing and editing of news stories than it has media that show any willingness to allow an impartial reporting on moderate and progressive views and people. The local Aberdeen newspaper is unabashed about giving favorable coverage to conservatives, no matter how extreme, and choosing to ignore progressive issues. When it does feel compelled to put on a demonstration of impartiality for the sake of journalistic credibility, it peppers its reports with snarky editorial critiques. This was evident in the 2004 campaign. When John Thune came to town and made a speech, the paper treated him like a rock star, reported on how his supporters fawned over him, and treated his stump speeches as if they were always fresh and brilliant. When Tom Daschle and Stephanie Herseth-Sandlin came to town, the news reports commented on how their stump speeches contained the same, old messages and said nothing new. If they stayed on message, they were accused of being redundant. If they departed into different issues, they were accused of being unfocused. I have not read all of Jon Lauck’s book, but enough to see that it is an extension of the complaints against the Argus Leader that his poltical blog and fellow bloggers took up during the 2004 campaign and his claim that they contributed to the defeat of Tom Daschle. Brent Lerseth, the reviewer for the Argus Leader, comments that a weakness of the book is that it does not give an accounting of how other media may have acted as a counter to the alleged bias of the Argus Leader. With all the attention to the claims of the Argus Leader’s bias, no one has paid much attention to the editorial bias toward the conservatives that is reflected in the other media throughout the state. A survey of what is covered and how it is covered by the other media could provide a more definitive explanation of why Tom Daschle lost. A book is waiting to be written from a more objective point of view on the 2004 campaign. Nationally, the campaign inspired a number of efforts at fact-checking because so much scurrilous and libelous information was put into circulation. One such effort was The Press Project headquartered in the Fargo area to examine the kind of political coverage and statements that was published and broadcast on the northern plains. The Project was largely devoted to fact-checking and analyzing the rhetorical practices for false information and fallacious reasoning. At first The Press Project was not going to examine blogs. The scholars and journalists who were doing the analysis did not think blogs were read by enough people at that time or were regarded as sources of information. In fact, at the time, according to the PEW Internet Project, only 11 percent of Internet users consulted blogs and a majority of those were for matters other than politics. However, advisors to The Project said that blogs did reflect the kind of thinking and tactics being used on the public and should be examined as expressions of what people were thinking and what was influencing them. The Press Project compiled the raw data which was to be used as the basis for a definitive study of what kind of information and ideas went into the campaign. Initially, some prominent writers and scholars agreed to do such a study, but since then they have indicated that there is other work they would prefer to spend their time and effort on. Reviewer Brent Lerseth stresses in his review that its purpose is not to evaluate the substantive claims made in Lauck’s book or to challenge or affirm them. In the election of 2004, fact-checking and rhetorical analysis became a huge issue. Scholars, journalists, and other writers became concerned about the kind of information that people were forming their opinions from. The salient and essential questions coming out of the campaign of 2004 is whether the people were being told the truth and whether they were being subjected to Orwellian mind-manipulation that fed on their fears, bigotries, and ignorance. A comprehensive review of Jon Lauck’s book will address those issues of accuracy and veracity. It is part of the campaign material that needs a definitive analysis. And some of us are still waiting fo such a review.